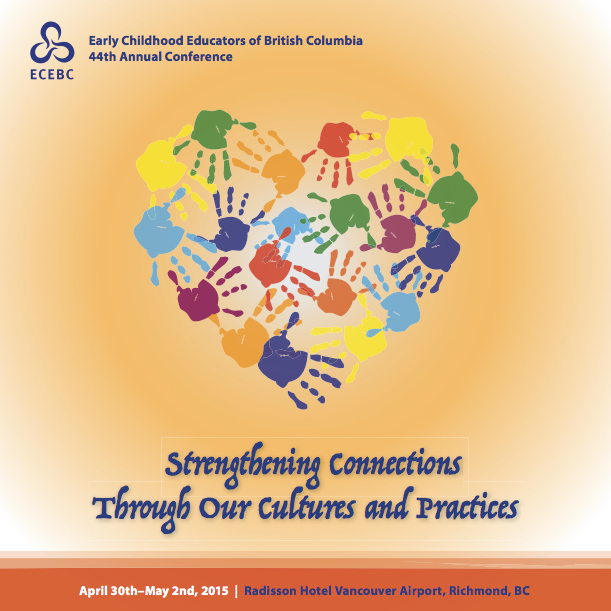 This year’s ECEBC conference, “Strengthening Connections Through Our Cultures and Practices”, will offer “opportunities to learn more about each other’s cultures and innovative practices to make our ECE culture and our own practice stronger.”, offering workshops that “give a First Nations perspective, examine how best to support newcomer families and integrate diversity into your program, and focus on pedagogical documentation, Reggio Emilia, and nature/forest preschools” amongst many other topics. “Best Choices: The Ethical Journey”, including four different workshops exploring the many ethical issues faced in ECE practice. Two childcare centre tours on Thursday evening: “one to a new and innovative nature-based preschool and one to a centre that puts culture at the forefront of their program”. The conference includes the ECEBC AGM on Friday, May 1 from 1:00 – 2:00 pm and a Trade & Resource Fair all day Friday, May 1 and until 2:00 pm on Saturday, May 2.